We Indian love to eat Paneer. Again thinking of making some new paneer dish? 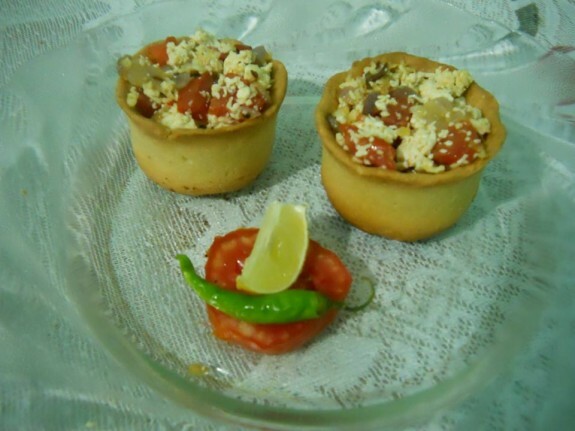 Here it presents a Crispy Cup Paneer Bharwan recipe for your snack time to enjoy. 1. Take a large bowl and mix plain flour, rice flour, baking powder and salt. Now add 2 tsp oil and mix it well on the whole mixture for 2 -3 minutes. 2. Add little water in the mixture so that you can able to make soft dough. Smashed the dough again and again to make it smooth very soft dough. 3. Now cover the bowl with wet cloth for around 30 mins. 4. Pre heat the oven. 5. Now take one foil baking cup and put a small portion of the dough in a form of cup inside the side of the foil cup. The layer of the flour cup on the foil cup should not be too thick. 6. Repeat the same process with rest of dough. 7. Now put all the foil cups in the baking sheet and baked it in the oven for 20 mins in 375 degree F. The temperature as well as time may up or down according to the oven and cups. In between check the cup whether it has baked and turn into light golden in colour or not. 8. Now, remove the foil from the baked cups. Your crispy cup is ready. 1. Heat oil in a pan. Add chopped onion and sauté it until light brown in colour. 2. Add chopped ginger garlic and again sauté it for 1 min more. 3. Add the tomatoes and fry them until soft. 4. Add red chili powder, green chili chopped, chaat masala powder and mix well. 5. Add smashed paneer and cook for 2-3 minutes. 6. You stuffing are ready. Now fill this stuff on the baked crispy cup and present it.